Nénuphar is a very energetic, if sometimes nervous horse. 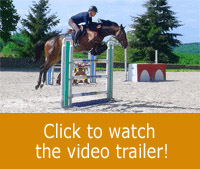 The goal is to ''harden'' the horse's physical and mental ability in order to improve his jumping technique and to incite him to approach obstacles calmly. Michel is conducting a gymnastic exercise over a jump in order to try to relax his horse to the utmost. Michel himself must work with as much mental and physical relaxation as possible, all the while remaining in control of speed and accuracy of line. This exercise is based on a repetition carried out while calm and with good humour, but always while requiring a good level of effort and determination from the rider. 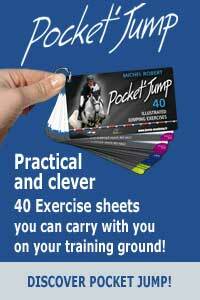 It is an exercise that is in-between flatwork and jumping. The rider maintains an attitude similar to that of a dressage rider. The reins, however, are long enough to permit the horse to stretch his neck out as much as possible, especially during the approach phases. The exercise over cavalettis and the line of cross-poles encourages a regular canter, and the horse to be right over the middle of the obstacles. You can notice Michel's relaxation and his hands accompanying the movement almost to an exaggerated degree during the take-off and over the obstacles. The horse has practically always a regular, constant canter. On the line, over the double-oxer which is first taken in five strides, then in four, Michel always tries to keep control of Nénuphar while staying relaxed. Notice that when the obstacles are bigger, the distance of 17m50 must be covered in four strides in order not to ask too much of the horse. However, the rider must maintain the same degree of control, accuracy, and rhythm.